Today I want to talk about a branch of physics with little life (let’s take a little time) and is gaining a lot of importance, quantum thermodynamics. But fist, I’m not an expert about. Thermodynamics is the part of physics that studies a type of manifestation of energy, heat, its properties and its effects. It is a very interesting part of physics that has given us definitions such as entropy, and thanks to it and its three principles have helped us to indicate the limits in macroscopic physics. In addition, thermodynamics is the basis of statistical mechanics and without it, this other important part of physics would not exist to help us quantify the energy of a system and therefore to measure what is called the information of the same. However, quantum thermodynamics is another different chant because although it studies systems at very very low levels of thermodynamic (let’s, transfer of energies) is not based on the postulates of macroscopic thermodynamics. In fact, the three famous laws that help us to say and shout because there are no perpetual motives do not work (not taken into account) in quantum thermodynamics. Something very curious. For that reason, the stochastic process hypothesis or Markov process very used in thermodynamics and that is totally mathematical helping to “control” totally variable systems from its current state (without taking into account as it was before, something that physics does a lot) Are totally ignored. Quantum thermodynamics uses some models to describe systems such as Brownian motion which helps us measure the passage of energy between different particles in systems that seem totally random. That is to say, systems based on the Brownian motion are considered, for example, the motion of particles in a gas, but, if we look at a smaller scale, in the wave functions of the components of an atom (eg, an electron) Browiano can help us to know how electrons move and transfer between several atoms, something very beautiful. One of the utilities in which quantum thermodynamics is being used (remember that even in diapers) is, for example, for the subject of batteries and their efficiency, since they look at the transfer of energy between the atoms of the material (or materials ) Can help us to improve its energy efficiency. Thus, for example two quantum entangled particles and therefore we can define them with a single state we have that their energy transfer is equal (for both) and the energy transfer interactions is of double. Thus quantum thermodynamics can help, if we can efficiently manipulate one of the particles, to have twice as much energy in a given model. What things!. 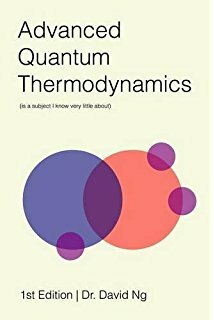 If you want to know more I recommend the book on the Advanced Quantum Thermodynamics by David Ng.